Zenon Schwabiuk says his new wristwatch allows him to keep track of his heart rate. Zenon Schwabiuk has never really thought of himself as much of a "techie." But his interest in consumer technology started to grow about a year ago, shortly after the 65-year-old Manitoba Hydro retiree suffered a heart attack. After being released from hospital, Schwabiuk counted his blessings and then joined the Reh-Fit Centre's popular cardiac rehabilitation program. For the next four months, the Winnipeg man unfailingly worked out twice week in a bid to rebuild his health. As part of the effort, he was invited to keep track of his heart rate to make sure he was getting the workout he needed to strengthen his heart. That's when he ran into a slight problem. Early on, he found it difficult to find his pulse, which meant he couldn't keep track of his heart rate. "I realized I needed something to give me my heart rate because I can't feel my pulse and look at my watch - that didn't work for me," says the grandfather of four. "And I couldn't keep asking the nurse there to take my pulse." Schwabiuk noticed that others at the gym had wristwatches capable of tracking a pulse, so he decided that might be the solution for him, too. Moreover, he'd seen watches on sale, so he thought: "This is ridiculous, so next time we go there, I'm buying one because I need to know (my heart rate)." The purchase changed his life. The man who once couldn't find his pulse was now able to check his heart rate at any time of day or night, simply by tapping the app on his new Garmin Vivosmart HR + watch. Zenon Schwabiuk models his new wristwatch. Today, Schwabiuk can't say enough good things about the wearable health technology that wraps around his wrist. And he is not alone. While these high-tech devices have been popular with young, active adults for some time, they are just now starting to catch on with the older crowd, especially those who are trying to get back into shape after a health scare. Increasingly, they are finding value in having a ticker on their wrist that can tell them what's going on with the ticker in their chest. Health and fitness professionals haven't skipped a beat either. Just as consumers are gravitating to new health-and-wellness-oriented technology that can help keep tabs on heart rates and glucose levels, so too are health professionals. In fact, some of the city's leading fitness, wellness and rehabilitation facilities are starting to incorporate different types of wearable technology - the category includes high-tech wristwatches as well as other types of gym-based monitors that track your heart rate and physical activity levels - into their wellness programs. 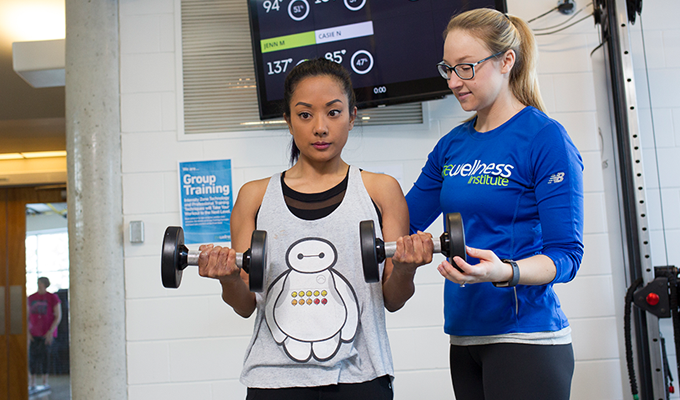 The Reh-Fit Centre, for example, recently started expanding the use of heart-rate monitors among its members. Previously, they were largely used by fitness buffs while working on a treadmill or other equipment with embedded technology. 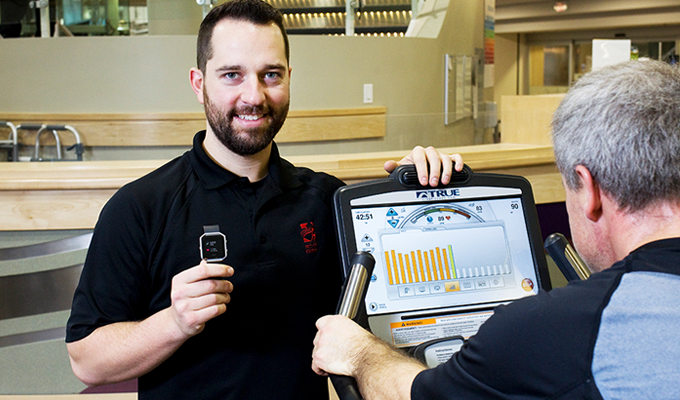 Now, Reh-Fit, located on Taylor Avenue, is starting to incorporate heart-rate monitors into its cardiac rehabilitation programs, says Dylan Cohoe, a fitness professional at the centre. The Wellness Institute at Seven Oaks Hospital on Leila Avenue is also integrating wearable health technology into its programs, according to Executive Director Casie Nishi. "What the research shows is that wearable technology is a top fitness trend, and it's a billion-dollar industry now," says Nishi. "We know it's growing, and most likely you or someone close to you is wearing one right now." There is no scientific evidence to suggest that these devices alone can compel someone to exercise more. In fact, one recent study published in the Journal of the American Medical Association from 2016 found wearables as a companion to weight loss programs did not add benefit. Ashley Derlago guides Shirley Platon as she lifts weights. The OnBeat system projects her heart rate onto the screen. Nonetheless, they are a useful tool for those who are committed to making lifestyle changes. "There are so many fundamentals of behavioural change - everything from building confidence in the people we see here, setting goals, reducing barriers and motivation - and wearables can help with those factors, but they tend to support rather than drive those factors," says Nishi. Moreover, the potential cannot be ignored. Nishi says she and other staff see clients using them increasingly - and raving about their benefits. For that matter, the staff themselves use them, and often "feel a little strange" when they're not wearing them, she says, herself included. "That's why we really try to embed them into our programs. They're popular, even if they don't replace the support of a professional and the support of a group - a peer environment - or that motivation you may get from social interaction," she says. Where these technologies are really proving beneficial, at least anecdotally, is in helping individuals who are seeking to boost their exertion levels. Rhea Vaags-Olafson, Co-ordinator of the Chronic Disease Program at the Wellness Institute, says wearables are particularly helpful for clients she works with. 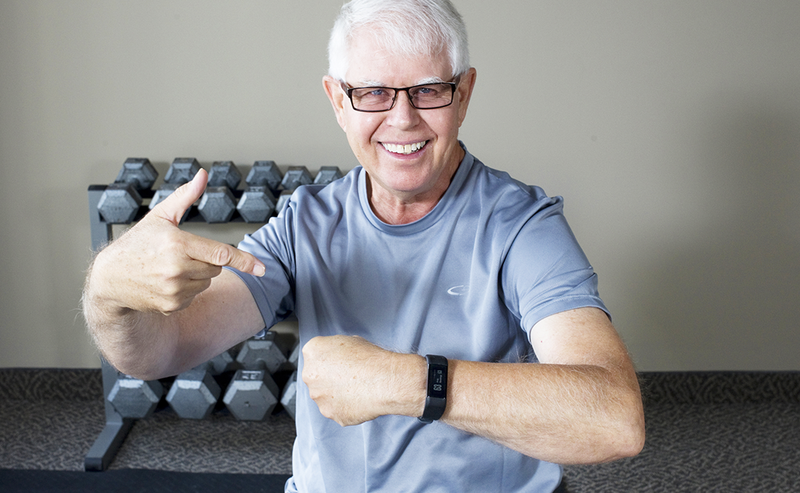 While they're not mandatory for cardiac rehabilitation programs, many participants either already use a fitness tracker wristwatch, or they end up buying one for one important reason: to easily monitor their heart rate. "We ask people to check their pulse, and a lot of times that can be a really frustrating thing for them, as they often mess around to even find a pulse because they have decreased sensation in their fingers as a result of other co-morbidities [like diabetes-related neuropathies]." For those who aren't using a wearable, "We don't suggest they have to get one, but we do tell them it's a better way for them to monitor their pulse and make sure they don't workout outside the level that we want them in." Rhea Vaags-Olafson holds an OnBeat heart monitor. Once strapped to a person's chest, the device can transmit his or her heart rate to a big screen or an iPad. More than anything else, watches with heart rate monitoring offer rehab patients a level of comfort and confidence, both of which can be in short supply following a heart attack. "They have this wearable monitor on them that basically gives them the confidence that they're okay." The Wellness Institute has also launched a fitness program open to general membership that incorporates a heart-rate monitoring technology called OnBeat, says Ashley Derlago, Manager of Coaching Services. A type of fitness software, OnBeat consists of a fabric strap containing a tiny heart monitor with Bluetooth technology that is wirelessly connected to a tablet computer or a giant TV screen. It allows a trainer to run a class while being able to monitor clients' heart rates as they work out. Essentially, there are three "zones" people should pay attention to when it comes to their heart: the resting rate, the target rate and the maximum rate. The resting heart rate is the load on your heart while you're sitting down at rest. For most people, that heart rate is between 60 and 100 beats per minute - though athletes often have resting heart rates between 40 and 60. Your maximum heart rate is calculated by subtracting your age from 220. So, a person who is 55 years of age would have a maximum heart rate of 165. The goal of a workout is to get your heart rate at the so-called target rate of 60 to 85 per cent of your maximum heart rate. This is where you will attain maximum cardiovascular benefits, Derlago says. Heart-monitoring systems like OnBeat are valuable because they provide a precise read on an individual's heart rate as they exercise. "We're able to project that data onto a screen and see our clients' heart rate so we know what zone they're in, and how hard they're working," says Derlago. "If it's a high-intensity exercise, we might say, 'We want you in the orange or the red zone,' which would be about 80 to 100 per cent of their maximum heart rate, depending on the type of exercise," she says. 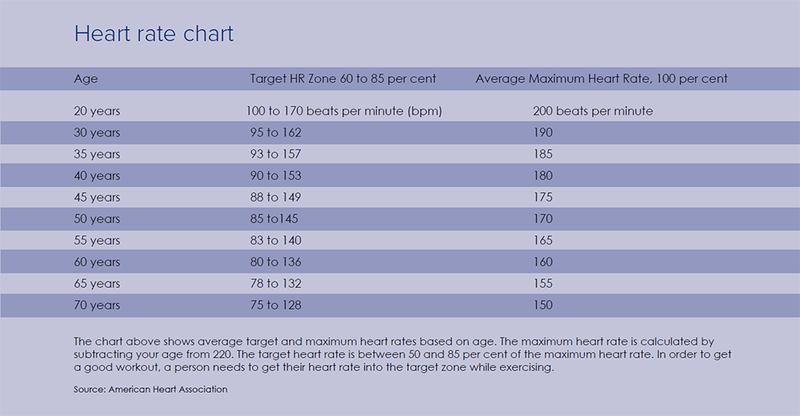 It's worth noting that the maximum heart rate is the point at which aerobic activity ceases and anaerobic activity begins. During aerobic activity, your cells use oxygen to convert glucose into energy. Anaerobic activity occurs when the body converts glucose into energy without the presence of oxygen. Needless to say, anaerobic activity only occurs during high-intensity physical exertion like sprinting because aerobic processes cannot keep up with the demand for energy. While the maximum heart rate represents the top end of someone's cardiovascular capabilities, it's by no means a "hard limit," says Derlago. Some individuals can exceed their maximum rate for short periods of time if they are very fit. "Anything under 75 per cent of your maximum heart rate, you're using more of an aerobic zone," she says. "Once you're training a bit harder, you're going to be in an anaerobic zone, and once there, you're not going to be able to sustain that for a long period of time." 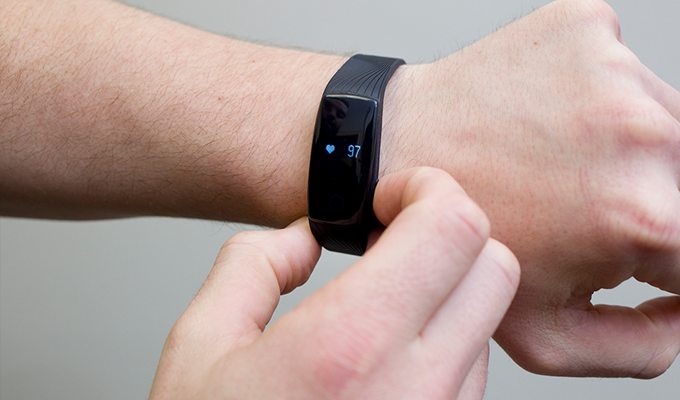 Some people transmit heart rate data from their wristwatches to their smartphones. While real-time heart-rate monitoring technology offers a window into the body's balancing act between energy synthesis and cardiovascular load unlike anything trainers and athletes have had in the past, it still does not replace a tried and true measure used for decades called "perceived rate of exertion." "We will ask, 'How are you doing?' and then we also consider how they look," Derlago says. "If they're red in the face and can't even speak, it's time to ease up. But if they can answer, 'I'm fine,' they're likely okay to keep going." Still, the technology offers additional insight. "Now we can see that someone is in the red, and if they're feeling good and looking good, then they are likely okay to push their intensity a little longer." So far, the pilot program has been a success. "It actually has boosted interest and enrolment," says Derlago. 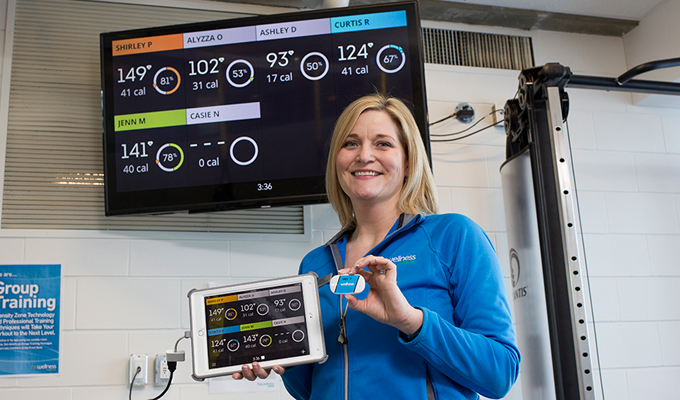 Over at the Reh-Fit, heart-monitoring technology has been incorporated throughout the rehab program. "We've started using them on a trial basis," says Cohoe. Patients find the technology beneficial because it provides them with added confidence to push a little harder while working out at the centre. "With cardiac rehab, everyone is inclined to think, 'I don't want to push it too hard or there will be an incident,'" says Cohoe. "But what I found is people tend to underwork themselves rather than overwork themselves, so with this technology, I was actually able to show them a graph of their heart rate during interval training on the iPad screen to show them they could indeed work a little harder." While still in its infancy, Nishi sees a bright future for wearable health technology. In fact, she believes it may help increase efficiencies in the health-care system. As an example, she offers up a scenario where someone with heart failure is hooked up to a network that monitors the person's heart rate. "If we can use wearables to detect if a patient is declining, we can intervene before they need to go to an emergency room," she says. "That means not only patient outcomes are better, but we can also use the health system more efficiently." Another example might involve a system that allows health-care providers to monitor individuals with kidney failure using digital scales to keep track of their weight. "You can see drastic weight changes with your fluid balances," Vaags-Olafson adds. "If there's a monitoring system where a health-care provider can see that, all of a sudden, there's a quick change in a patient's weight, that is an early indicator that the person is decompensating, and care can be initiated before it becomes urgent." 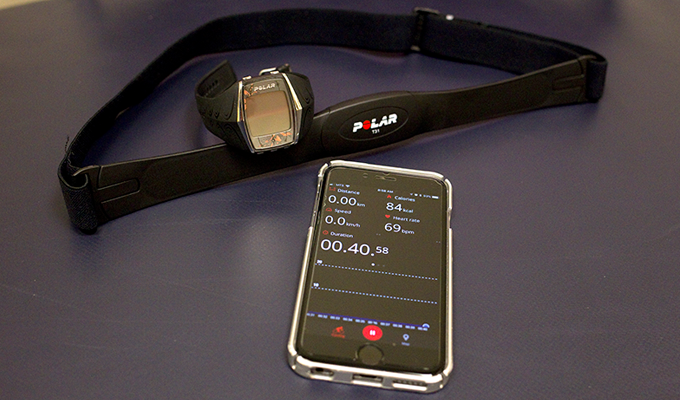 Dylan Cohoe says heart-monitoring systems ensure clients are getting the workout they need. Vaags-Olafson foresees a day when smart watches or phones can monitor blood pressure and other vitals. "I recently went to a conference where I saw technology that would allow your phone to take an electrocardiogram [EKG]," she says, in reference to a test commonly used to detect potential heart attacks. "So, this technology is huge in terms of its potential, as it could track if you were having a cardiac event and link it to an emergency system, so an ambulance would be sent." Derlago says technology is already available for individuals with diabetes to check their blood sugar using a mobile phone. "It avoids you having to prick your finger all the time." The challenge going forward is compiling the data these technologies produce, and comparing the findings with actual behaviour to better understand how wearables might be optimally used to benefit healthy people and those with health challenges. "The assumption so far is that by telling people how many steps they're doing and how they're sleeping, that it will educate them, motivate them and change their behaviour," Nishi says. Of course, as previously mentioned, wearables offer feedback, education and motivation, which suggests an opportunity for long-term behaviour change, although research has yet to bear that out. "I think everyone knows now that 10,000 steps a day is a good guideline [for maintaining your health], but these technologies haven't changed behaviour much," she adds. That doesn't mean they have no benefit. Rather, studies have shown the technology is accurate and educational. They just do not drive behavioural change on their own. "The key challenge is how do you embed it in health care and not lose sight of the personal and social support?" Nishi says. "It's got to be used as a tool that can help. It can't be the one solution." Schwabiuk, meanwhile, can vouch for the benefits he's experienced from his smart watch as he continues on his path to fitness. While cardiac rehab ended in in October, he still makes the long trek by bus two to three times a week. "I would recommend it [the watch] even if you haven't had a heart attack, because you can see how many steps you're doing in a day, and a lot of us don't get enough activity," says Schwabiuk. "But for me, after having a heart attack and doing my workouts, I want to know what my heart rate is -and this is absolutely the best way for me to do it." 1. Smart watches: Whether it's a Fitbit, an Apple Watch or a Garmin, options increasingly abound for health-conscious individuals. Besides counting your steps and monitoring your heart rate, they can also tell you how much you're sleeping - if you wear one to bed - as well as know how many calories you're burning at rest and at play. You can also receive texts and emails, listen to music from "the cloud," and even pay for a post-workout smoothie. And yes, you still can use them to tell time. 2. Heart-rate monitors: For keeping tabs on your ticker while working out in the gym, a dedicated heart-rate monitor can't be beat, says Dylan Cohoe, a fitness and rehabilitation trainer at the Reh-Fit Centre. Among the most popular brands is Polar, which comes with Bluetooth technology for wireless data transfer and monitoring. While top-line monitors can cost more than $100, they are generally considerably less costly than most smart watches, which usually cost at least $100 and even exceed $900 at the high-end. Additionally, Cohoe says most monitors synch with the latest treadmills, elliptical machines and other fitness equipment with embedded electronics. 3. Glucose monitors: People with diabetes can now check their blood sugar with continuous glucose-monitoring technology, including devices like the Dexcom G5. A small sensor is inserted under the skin to measure blood sugar levels, and then is fastened to a transmitter sending data wirelessly to a compatible smart phone or watch. The devices eliminate using lancets and strips, allowing for easy, pain-free checks. The technology also alerts you when your blood sugar levels are too low or too high. 4. Smart headphones: JBL is among the electronics manufacturers offering wireless headphones that do more than provide great audio. Its Reflect Fit headphones monitor your heart rate. Other models also provide updates for pace, distance and whether you're achieving your target heart rate. 5. Intelligent trainers: Not only will these sneakers get you from point A to B, they'll tell you how well you got there. Among them is Under Armour's new Gemini RE smart shoes, which measure distance, stride and speed. They will even tell you how warmed up you are prior to starting your workout - relaying data wirelessly to your smart phone or watch.